3 different verifiable trusted sources, if you don't have them don't air the story; if you have to air the story with less than 3 different verifiable trusted sources just make sure you mention it in the disclaimer at the beginning and at the end. Sounds familiar? 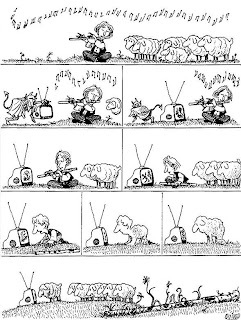 That was the old days of professional journalism, not any more. A shaky mobile video with low camera resolution, some sound effects, and lots of movements, by a 'somebody', could be a 'citizen journalist', an 'eye witness', an 'activist', just 'anybody' as far as it serves the purpose; this is the replacement of journalism today. 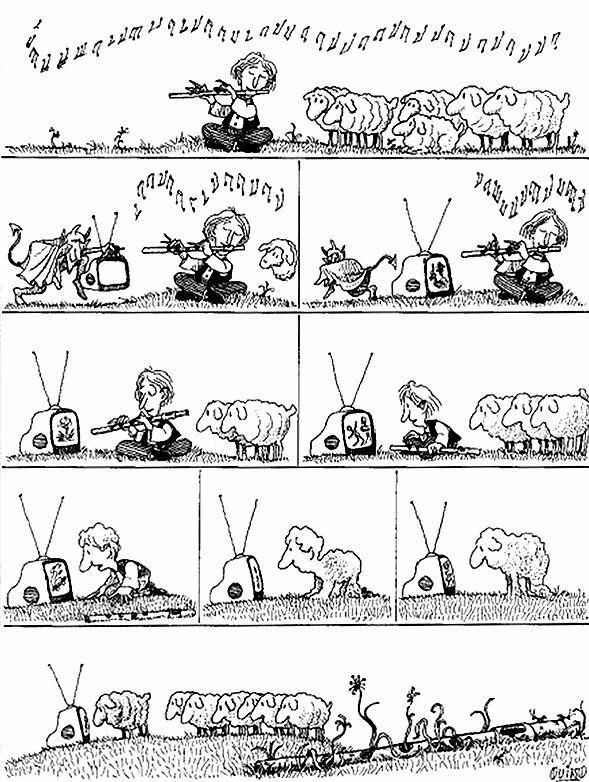 Reliable and well established news houses would refer to the first option above to preserve their professionalism and their credibility, but the price sometimes is much more worth than credibility, if you don't add drama and action to your stories, people would shift to where they can find it, people want to see blood, atrocities, crimes, the highest watched are the most violence, some very few would still want to hear good news. To add some spices to your news, bring on 'analysts' to discuss from their point of experience what's really happening to the audience who are too lazy to work their brains to analyse themselves and would prefer a fast meal of junk news, then ask to recruit some people of public desire like celebrities, clerics even fortune tellers so your story gets more attention and more talks, who cares whether it's true or not? People want action and fiction so just give them what they want. First, I'll advise you to take a look at how journalism is supposed to be based on by reading the Society of Professional Journalists: Code of Ethics. Then when you are ready, come back here and check the following example. The following is just one example out of tens of thousands that are polluting our environment with propaganda in a systematic way just to serve the same parties, those who ignite strife amongst 'rogue nations' citizens, then cry because of the bloodshed, then interfere to stop the bloodshed by shedding much more blood than would ever occur by its own, then crying again to get the rebuilding contracts. 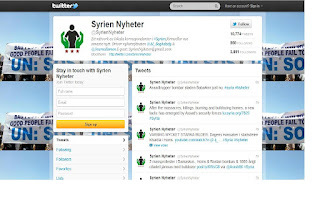 He tweets: "#Syria Statistics 383 Days: Killed:12,460 Children:882 Females:773 Soldiers:1,089 Missing:+65,000 Tortured to death:491 Arrested:+212,000" and he's literally nobody, but has 4,826 followers as of now, and this 'tweet' gets 50+ retweets (Twitter doesn't count beyond 50 retweets, this figure could be hundreds) then this is followed by another tweet: "The source of the Syrian casualty/ arrest stat is an independent Swedish journalist SyrienNyheter"
Then someone smarter would ask: "and what are his sources? i mean, is that independent journo in Sweden or Syria?" Reply: "He's done the count himself. He's been covering it since beginning."! 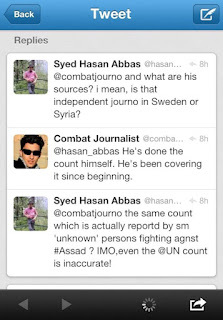 And who is this super journalist that can count by himself: "12,460 killed out of which he was able to identify 882 children and 773 females (I assume adult females), 1,089 Soldiers (killed by who? ), he also counted over +65,000 missing, 491 tortured to death and over 212,000 arrested"? 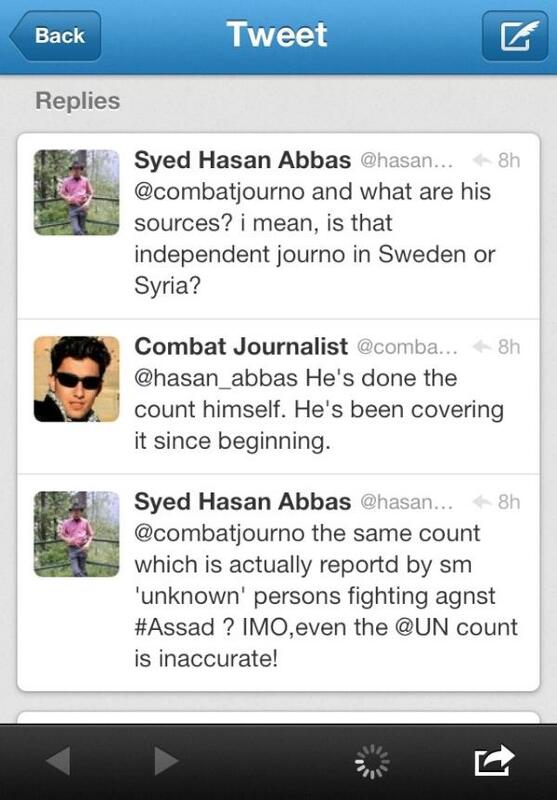 Let's assume he did all this counting in 383 days, where is he doing the counting and who is this super independent Swedish journalist? 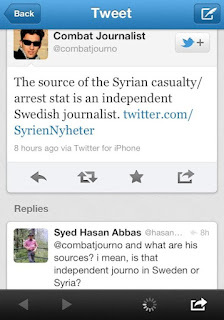 He's anonymous, and if an independent Swedish journalist being an anonymous is not credible enough, from where is he sourcing his information and statistics? Don't guess much, he stated it on his own profile, it's from Bassam Al Baghdadi, an Iraqi writer living in Stockholm, Sweden and counting the Syrian casualties! It's a Top Tweet by a guy sitting in Kabul, Afghanistan! A nobody sitting in his tent in Kabul, Afghanistan with let me assume, some NATO technology to stay connected from there, reporting news about Syria, basing his reports on an 'independent Swedish journalist' who happens to be another nobody sitting in Stockholm, Sweden who did the counting of casualties himself by sourcing his information from an Iraqi writer living in Stockholm, Sweden! There you have your 3 credible sources. Go ahead and shoot it at the public. 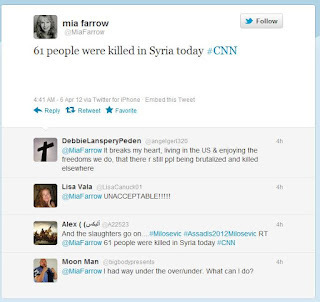 I'm sure Mia Farrow is not involved out of her sudden love to the Syrian people, otherwise she would have done something to stop the unilateral sanctions imposed on the Syrian people by the same powers crying for the Syrian people. There is killing in Syria, there is a crisis there, but the questions everybody should ask are: Who is doing the killing? Who are the victims? 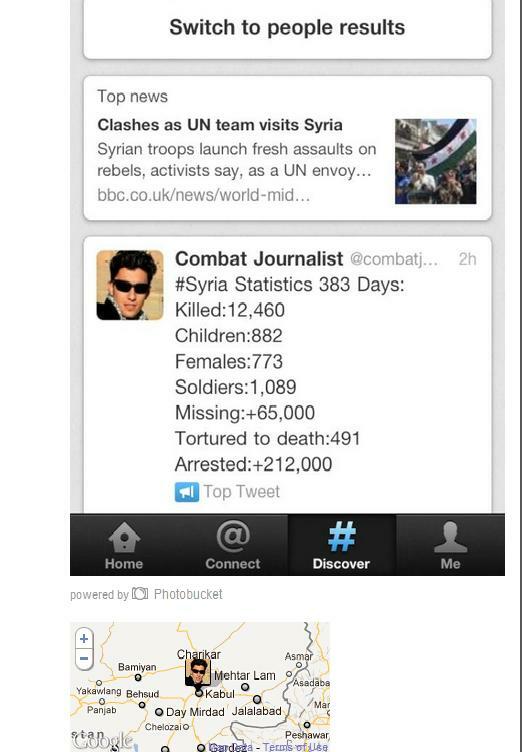 How can over 3,000 soldiers be killed and by who? Surely not by some chants of 'peaceful protesters'. 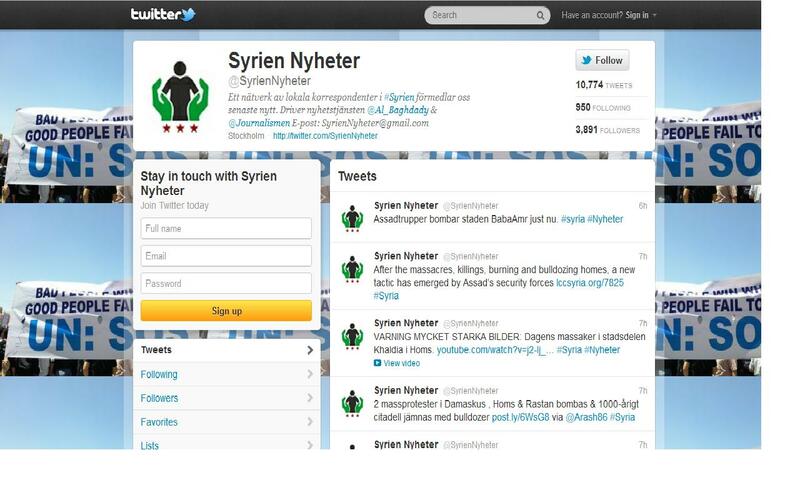 Who did the many suicide bombings Al Qaeda style in Aleppo and Damascus? 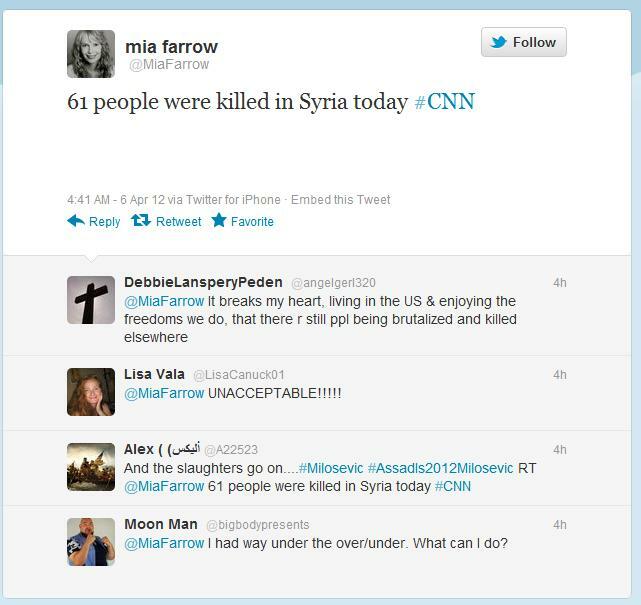 Who benefits from the killings in Syria? Should we accept that NATO destroys Syria like they did in Libya, devastate the country, kill tens of thousands of Syrians like they killed over 120,000 Libyans (Libya's population is 9.6 million or was living on over 1.75 million square kilometres comparing with 24 million Syrians living on 185,000 sq. kms) to come one year later and say: "No Evidence That Gaddafi Fired On His Own People"
Or like the Iraqi case still looking for those Saddam's Weapons of Mass Destruction that caused the deaths of over a 1 million Iraqi, displacement of 4 million internally and across the borders, and sending the country to pre-Stone age. As I say always: They fool you, they keep fooling you and they enjoy fooling you, not because they're smart, it's just because you are 'Foolable'.